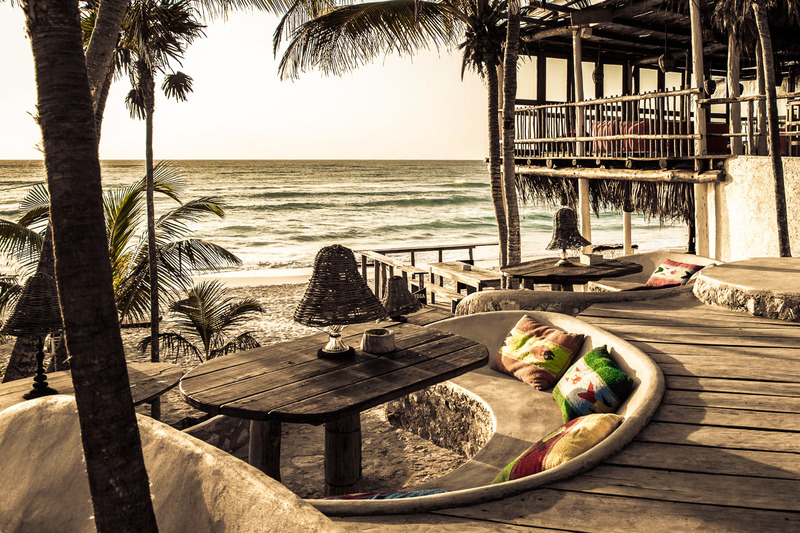 Beach bar and lounge at Papya Playa Project in Tulum, Mexico. Where palm trees, white sand, day beds and the Caribbean Sea come together in the best possible way – welcome to the delightful Papaya Playa Project in Tulum, Mexico. Palm tree-lined jungle, a white sand beach dotted with day beds, the Caribbean Sea a barefoot stroll away… the Papaya Playa Project is the kind of place you want to be marooned (BYO Wilson). This unique property in Tulum is far removed from the flashy resorts in the tourist hotspots it’s sandwiched between (Cancun is roughly 130 kilometres north and Playa del Carmen 70 kilometres south). Originally designed as a communal playground for creatives in the form of a pop-up hotel, it’s thankfully here to stay and has been given the über cool Design Hotels touch with a refreshingly pared back, barefoot luxury, bohemian vibe. The hotel has a strong sustainable ethos, sourcing local food for its light Mexican fare-based menu, as well as using green products, recycled water and low-pressure showers and toilets. The 85 palapa-thatch roof cabañas and casitas have been ecologically built with local materials and designed with the bare necessities. Open planning takes advantage of gentle sea breezes with fresh colours, simple furnishings, cosy beds (some with mosquito nets), and the real clincher – no power. But who needs to stare at a screen when you can gaze out at the breathtaking Caribbean Sea? To really get into the swing of your castaway-style holiday, pull up a chair (or a hammock, if you’re lucky) on your private deck for an afternoon margarita-induced siesta. As we said, bare necessities.